MOUNTAIN AREA — The National Weather Service (NWS) in Hanford says heavy mountain snow is expected starting late Tuesday afternoon, Mar. 26 and continuing through late Wednesday night, Mar. 27. One to two feet is possible above 5,000 feet, with amounts approaching three feet above 8,000 feet. Very gusty winds are also predicted in the high country above 7,000 feet. Whiteout conditions are anticipated with chain controls required and possible road closures. Below the snow line into the Sierra foothills and lower elevations of the mountains, Hanford says Rainfall amounts in the Sierra and foothills could be as much as two inches from Mariposa to Fresno County with a quarter-inch to 1 inch in Tulare County. The front pushes through on Wednesday night and into Thursday with some residual upslope clouds and light rain expected in the Sierra and Kern County mountains. Very gusty winds are possible behind the front on Wednesday evening across and just below the Kern county mountain passes. The weather will likely be clear on Friday and Saturday, Mar. 30 – 31, with above-normal temperatures and dry conditions. The NWS models show another system moving into the Sierra that could impact the mountains, mainly north of Kings Canyon, Sunday and continuing through Monday, Apr. 1 – 2. 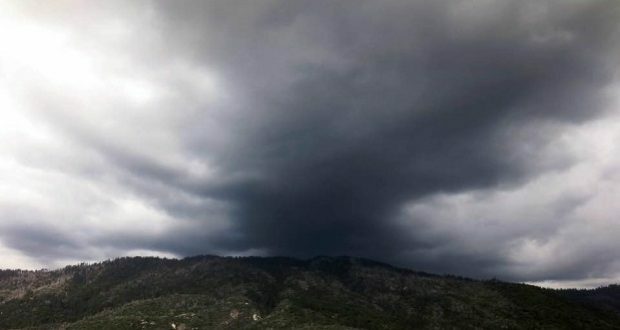 The National Weather Service in Hanford CA has issued a Tornado Warning for Southwestern Mariposa and Central Madera Counties, and Eastern Merced County until 6:30 p.m. on Wednesday, Mar. 27. Severe thunderstorms capable of producing both tornadoes and extensive straight line wind damage were located 14 miles northeast of Chowchilla, or 18 miles east of Merced, moving east at 20 mph with a potention for a tornado and quarter size hail. Flying debris will be dangerous to those caught without shelter. Mobile homes will be damaged or destroyed. Damage to roofs, windows, and vehicles will occur. Tree damage is likely. This tornadic thunderstorm will remain over mainly rural areas of southwestern Mariposa, central Madera and eastern Merced Counties. Move to a basement or an interior room on the lowest floor of a sturdy building. Avoid windows. If you are outdoors, in a mobile home, or in a vehicle, move to the closest substantial shelter and protect yourself from flying debris. The National Weather Service has issued a Special Weather Statement for the Mariposa, Madera, and Fresno County Foothills and East-Central San Joaquin Valley for significant weather until 5:15 p.m.
At 3:29 p.m. the public reported a funnel cloud associated with a strong thunderstorm near Winton, or near Atwater, moving northeast at 20 miles per hour. Half-inch hail will be possible with this storm. This storm may intensify, so be certain to monitor local radio stations and available television stations for additional information and possible warnings from the National Weather Service. At 4:04 p.m. a severe thunderstorm was located 8 miles southeast of La Grange, or 17 miles northeast of Atwater, moving northeast at 20 mph. Damage to vehicles is expected. At 4:43 p.m., Doppler radar was tracking a strong thunderstorm 7 miles southeast of La Grange, or 18 miles northeast of Atwater, moving northeast at 30 mph. Half-inch hail and winds in excess of 30 mph will be possible with this storm. At 4:58 p.m., Doppler radar was tracking strong thunderstorms along a line extending from 7 miles east of La Grange to 10 miles southwest of Chowchilla. Movement was east at 20 mph. Bootjack, Mariposa, Planada, Catheys Valley and Lake McClure. Frequent cloud to ground lightning is occurring with these storms. Lightning can strike 10 miles away from a thunderstorm. Seek a safe shelter inside a building or vehicle. The NWS has issued a Winter Storm Warning for snow for the Sierra Nevada from Yosemite to Kings Canyon/Tulare County Mountains. The watch is in effect from 11 p.m. on Tuesday, Mar. 26 through 5 a.m. on Thursday, Mar. 28 and includes the towns of Bass Lake, Fish Camp, Wawona, and also Yosemite National Park. A Winter Storm Warning for snow means severe winter weather conditions will make travel exceptionally hazardous or impossible. If you plan to travel, consider alternate strategies. If you must travel, remember to carry tire chains, plenty of food, a good deal of water, and warm clothing in your vehicle. Heavy snow is possible above 7,000 feet, with total snow accumulations of one to two feet likely above 7,000 feet. Localized snow accumulations around three feet are possible along the crest. Winds could gust as high as 65 miles per hour on exposed ridgetops and near the crest. Travel could be extremely difficult or impossible. Gusty winds may bring down tree branches. The hazardous conditions could impact the morning or evening commute. If you plan to travel, consider alternate strategies. If you must travel, remember to carry tire chains, plenty of food, a good deal of water, and warm clothing in your vehicle.